The newly released Torrium water pressure system controller introduced by Davey Water Products will significantly increase the convenience, reliability and satisfaction of householders who rely on an electric pressure pump system for their home water supply. Torrium is the result of several years of design innovation and a significant capital investment in research and development, together with thousands of hours of testing under the most arduous environments in all parts of the world. Torrium quite simply is a pressure system controller which thinks, using advanced microprocessor technology, to ensure a constant flow is available at all times. Torrium adapts to the system conditions to ensure optimum consumer satisfaction with the water supply. In short Torrium by Davey Water Products ensures that the best water supply performance is delivered at the system outlets. Gone are the fluctuations in flow rate or pressure caused by pump cycling. When coupled with the right pump, Torrium can even ensure multiple outlet usage does not result in pressure fluctuations. The risk of a pump continuing to run without water is avoided. Torrium will automatically sense if a loss of water supply or prime is reached and will shut the system down as a protective measure. Its auto retry function will also test to re-establish if the prime or flow is possible. Importantly Torrium incorporates other valuable features in simplified fault finding, with a series of status indicator lights to determine faults quickly and accurately and show their cause. For instance, if there is a leaking or dripping tap, a slow filling toilet cistern, water over-temperature or other system faults, Torrium by measuring the system pressure, flow, temperature and timing, will quickly adapt to ensure the best in comfort and convenience for the end user. Davey Water Products product specialist Ashley White said that Torrium is the next generation of pressure system controllers. "Fifteen years ago Davey led the way with the release of our Hydrascan® controller which has become the industry standard feature. "Davey's new Torrium is the result of a commitment to leading edge research and development. "It incorporates best practice engineering and electronics, with advanced encapsulation coupled to a fundamental understanding of the needs of the end user. "The Torrium has just been released to an enthusiastic reaction at the Davey Water Products International Dealer Conference." Mr White added. The Torrium controller is now the standard controller on all Davey electric pressure pump systems including the new HP models as well as the popular XP350, XJ, HS and M Series ranges, which address the water supply needs from a small cottage right through to the premium pressure systems for large multi-storey homes with multiple bathrooms. Importantly the Torrium can be used to upgrade existing electric pressure systems with inexpensive adaptor kits as required – even other brands or pump. 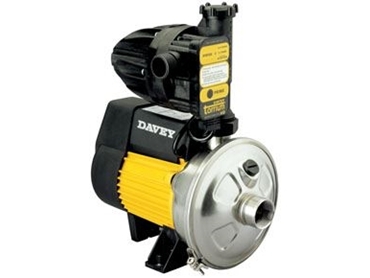 In many instances Torrium will fit directly on to an existing Davey pump. Standard BSP inlet and outlet plumbing fittings make a Davey electric water pressure system with the Torrium pressure control system a breeze to install. The compact Torrium electric pressure control system is made in Australia and with its improved performance and operating features amazingly does not add to the purchase cost of a Davey electric water pressure system.